Kurt Adler Disney Princess Hollywood Nutcracker, 16.25'' by Kurt Adler at Two Clock. MPN: DN6162L. Hurry! Limited time offer. Offer valid only while supplies last. Designed by renowned artist Holly Adler, Hollywood Nutcrackers is a whimsical collection of nutcrackers created exclusively for Kurt S. Adler, Inc. Designed by renowned artist Holly Adler, Hollywood Nutcrackers is a whimsical collection of nutcrackers created exclusively for Kurt S. Adler, Inc. and features an assortment of designs including Christmas, fantasy and everyday nutcrackers. Their designs put a unique, vibrant, memorable twist on traditional nutcrackers. 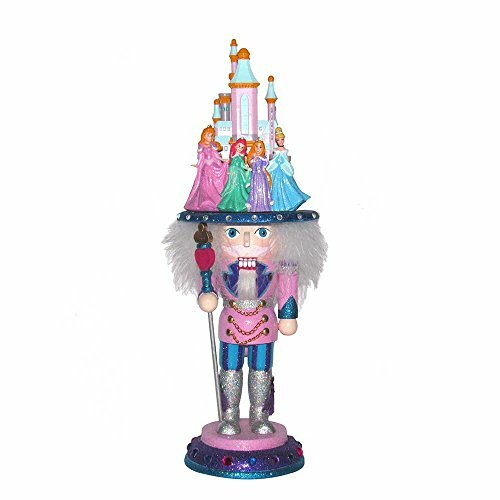 This nutcracker brings the magic of Disney to your Christmas decor. Its sparkly pink, blue, purple, and silver design is topped with a pink and blue castle surrounded by four of your favorite Disney princesses: Aurora, Ariel, Rapunzel, and Cinderella. Each princess is wearing her signature gown for an extra special touch.